Submitted by Emily Brightwell on Mon, 2006-07-24 23:55. 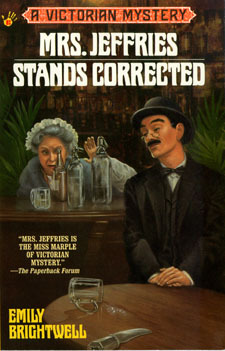 When a local publican is murdered, Inspector Withersppon takes Mrs. Jeffries advice to heart. He is going to trust his own instincts..but that keeps Mrs. Jeffries in the dark. She must rouse the household staff to action and hope the Inspector doesn't arrest the wrong person before they can solve the crime!